Ethnic Chopz, World & Ethnic Sample from ModernBeats. The sample library includes "hundreds of live performance samples of 10 rare ethnic instruments including hooks, riffs, and licks specially designed for modern urban and pop music production." The Ethnic Chopz Sample Library was recorded at 4 tempos (87 BPM, 92 BPM, 97 BPM, & 102 BPM) and in 4 key signatures (A minor, C minor, E minor, & G minor). A total of 40 software sampler presets are included that auto-load all ethnic samples into your software sampler of choice: Reason NN-XT (.SXT), EXS24 (.EXS), Kontakt (.NKI), Battery (.KIT), Halion (.FXP), Soundfont (.SF2), and WAV (.WAV). 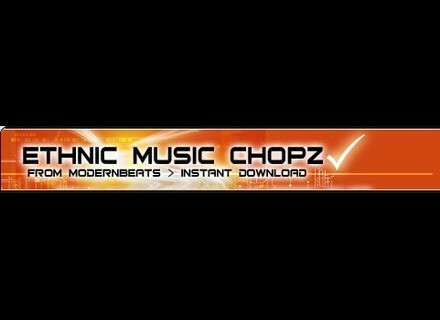 Ethnic Music Chopz 1 is offered as a download and priced at just $39.95. For more information & demos, visit: www.modernbeats.com/soundsets.php.